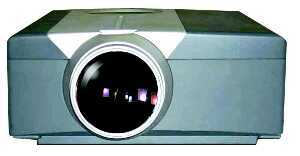 The SLCHB1 is SIM2s flagship in light & bright LCD projectors. With its powerful 1800 ANSI lumens, true 1024x768 resolution, and reduced 5,9kg weight, the SLCHB1 addresses corporate needs of bright images in far-from perfect ambient light conditions. In conference rooms, training seminars, meeting rooms and wherever business may require very large computer or video pictures the SLCHB1 is a small bright power, well-suited for both fixed or semi-mobile installations and for on-the-road presentations. It will be available in September 1999. Hi-tech features include an impressively precise digital keystone correction to get square-corner pictures from any table top. Unprecedented is also the digital picture magnification feature, to enlarge smaller details, and the picture-freeze function, that allows memorization of a whole frame. To wrap up multimedia features, the SLCHB1 sports TV-like Picture-in-Picture function to show video and computer sources at the same time, a must-have wireless mouse function and the ever more useful USB interface. Power zoom and focus are coupled to a projection distance that can reach 11m and throw a 300-inch screen. Video quality has not been overlooked: it is extremely captivating, both in video and in S-Video, and it comes in all major standards: PAL, SECAM and NTSC. No matter how fierce ambient light may be, the SLCHB1 throws bright, contrasted images in all conditions, on the strength of a low-consumption, efficient 190W UHP lamp. The three 1.3" polysilicon panels assure compressed SXGA resolution, 16.7 million colors and 8-bit color depth. The SLCHB1 is also MAC 13" and MAC16" compatible and ships with a complete cable set.brightness and light weight it offers optimum portability, making the SLC easily transportable from one venue to another. Remote control: wireless infrared full function R.C. that can be used like a mouse. Built in laser pointer. Standard accessories: Remote control, batteries, power cables, VGA cable, Mac adapter, RCA video/audio cable. RS232C cable, stereo mini/RCA cable, PS/2 muose cable, ADB mouse cable.